There are seven basic tools that can help teams in a QI effort to help clarify quality issues, analyze data, and improve processes. The challenge is learning when to use which tool. These tools are discussed below. A flow chart is a visual representation of the flow of work within or through a work area. A flow chart can be used to describe a process resulting in a service or a product. It is used to identify how the work progresses, where decisions are made in the process, and what the final outcome is. It can also identify who is involved. A cause-and-effect diagram (also known as an Ishikawa diagram or fishbone diagram) is used to categorize and display causes of quality problems and help team members identify potential areas for improvement. This diagram is used to associate multiple possible causes with a single effect. Thus, given a particular effect, the diagram is constructed to identify and organize possible causes of it. The primary branch represents the effect (the quality characteristic that has been designated as needing to be improved and controlled) and is typically labeled on the right side of the diagram. Each major branch of the diagram corresponds to a major cause (or class of causes) that directly relates to the effect. Minor branches correspond to more detailed causal factors. This type of diagram is useful in any analysis, as it illustrates the relationship between cause and effect in a rational manner. A Pareto diagram is used to help team members identify the most significant causes related to process performance and helps with decisions about which factor to address first. 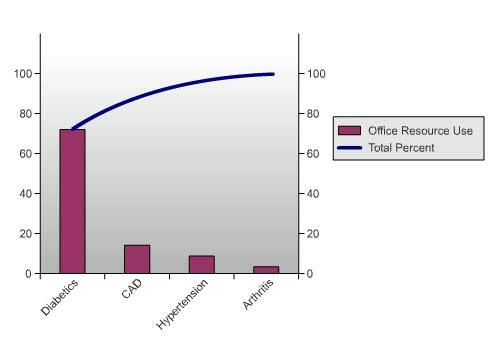 The Pareto diagram is a bar chart with frequency or cost displayed on the vertical axis and causes on the horizontal axis. The causes are ordered along the horizontal axis from most to least frequent or most to least costly. There is a cumulative line chart above the bars that indicates the cumulative contribution of each cause to the total of all preceding causes. The line chart is created by plotting the cumulative frequencies of the relative frequency data (event count data) in descending order. When this is done, the most essential factors for the analysis are graphically apparent and are in an orderly format. Pareto diagrams are useful because they identify factors that have the greatest cumulative effect on the system and thus screen out less-significant factors. Ideally, this allows the user to focus attention on a few important factors in a process. Reference: Juran, J. 1992. Juran on Quality by Design: The New Steps for Planning Quality into Goods and Services, rev. ed. Free Press. 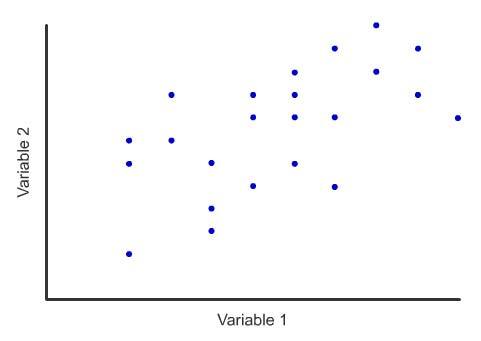 A scatter diagram is used to determine if there is a relationship between two variables by plotting paired data for the variables on a vertical and horizontal axis. The scatter diagram can help team members understand the type of relationship that exists (if any) and the strength of that relationship. While a scatter diagram may be used to help determine whether a cause-and-effect relationship exists between two variables, it will not prove that one variable causes the other. It will only demonstrate whether there is (or is not) a relationship. A histogram is a bar graph that depicts how much variation there is in a collection of data and, therefore, in the process being studied. 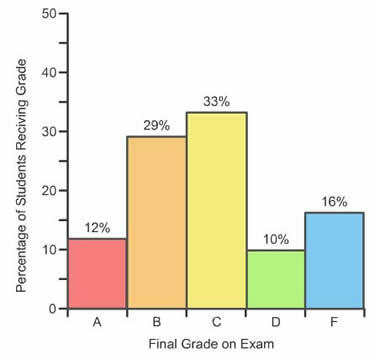 The height of each bar shows the number of data points falling within that interval. There is some variability in all processes, and the histogram can help team members understand that variability. Histograms provide a simple, graphical view of accumulated data, including its dispersion and central tendency. Histograms are easy to construct and also provide the easiest way to evaluate the distribution of data. A run chart show changes in the way a process works during a period of time. A quality characteristic is selected, monitored, and plotted at equal intervals for the length of the study. A run chart is one of the simplest tools to construct. Data are plotted in time order, so the graph aids in understanding how basic characteristics of a process vary and, therefore, how process performance can vary. 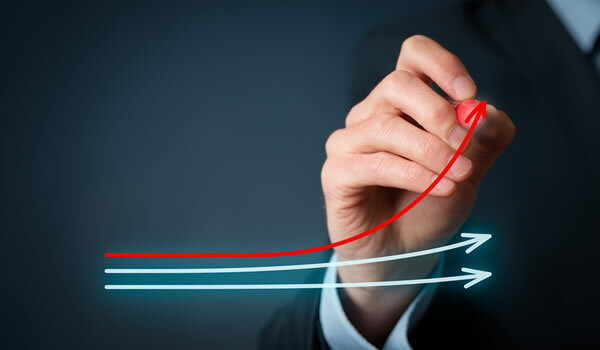 A control chart is the fundamental tool of statistical process control, as it indicates the range of variability that is built into a system (known as common cause variation). It helps determine whether a process is operating consistently or if something has caused the process mean or variance to change. 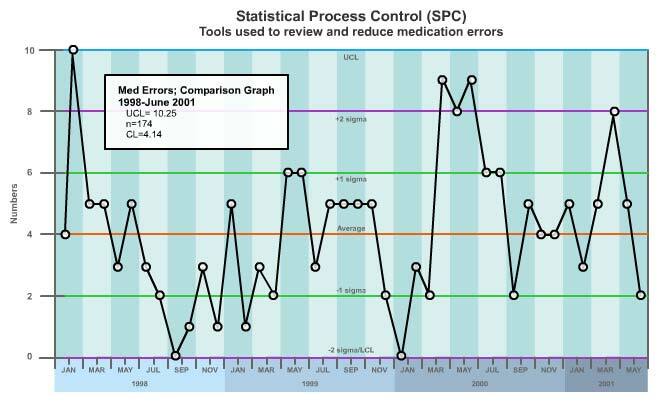 The bounds of the control chart are marked by upper and lower control limits that are calculated by applying statistical formulas to data from the process. Data points that fall outside these bounds represent variations due to special causes, which can typically be found and eliminated. On the other hand, improvements in common cause variation require fundamental changes in the process. The purpose of constructing control charts is to allow the detection of any trends or changes in processes. A control chart differs from a run chart in that control limits are statistically calculated for the process based on its typical performance. The data are plotted and compared to these limits. 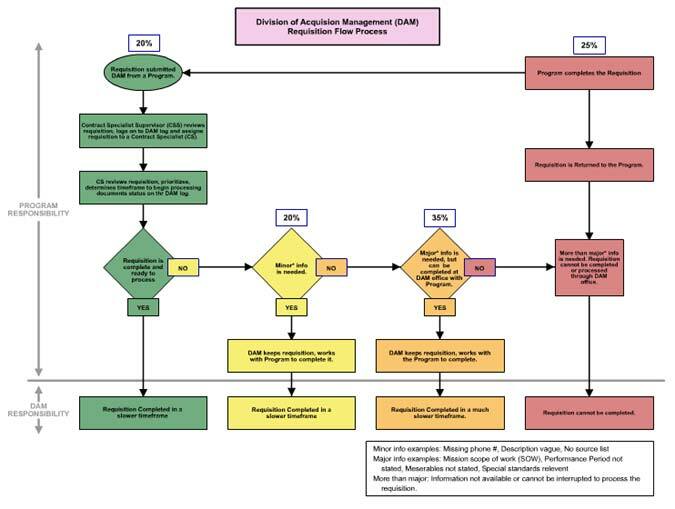 The control chart can help team members determine when a process is operating within expected limits of variation or when something unusual has occurred. The chart can also be used to monitor the effects of process improvements. The centerline of a control chart is the mean of the sampling distribution. The upper and lower control limits, called 3-sigma limits, are calculated as the mean plus or minus three times the standard error of the mean.